This is a purportedly true-life story of a British man's contact with aliens, back in the 1960s. 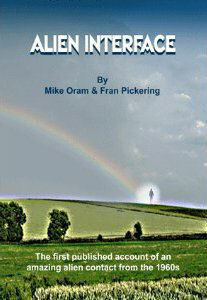 The subject of this alien contact has only chosen to come forward relatively recently - providing a detailed account of his interaction with aliens to UFO researchers Mike Oram and Fran Pickering. Despite the passage of time, his story is presented clearly and relatively consistently, and is set out in this book in the form of transcripts of recorded interviews. George gives us a remarkable, somewhat incredulous story of three meetings with visiting aliens in a quarry near his home, complete with observations of their classic-looking flying saucer in flight, and detailed descriptions of the aliens themselves as well as the inside of their craft. It's a fairly typical account within the context of the Contactee experiences of that era. The aliens are genteel, diplomatic and considerate hosts. They seem remarkably open about their capabilities, mission and concerns for our welfare, even providing intelligence about where their bases on Earth are located. The primary contact is with an alpha-male alien (thankfully un-named) with superb English, enduring patience, and a keen sense of humour. One imagines he would be awfully good at cricket. The female aliens seems to play a subservient role, acting like 1950s housewives aboard the flying saucer - with the additional feature of being somewhat overly keen to copulate with our reticent storyteller. To complete the domestic picture on the saucer is the presence of a lower form of alien life, which fulfil the role of guard dogs/manservants (the initial abduction by these creatures seemed uncannily similar to encountering the Morlocks in the 1960 film 'The Time Machine' (right)). Which brings us to the message imparted by the alien visitors; a quintessential part of all Contactee encounters. 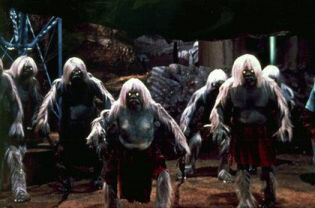 Invoking Biblical references as historical fact, our genteel alpha male alien turns prophet. Human civilisation is in danger of implosion, the fragile Earth faces destruction from an incoming galactic object of uncertain providence (sounds like Planet X, timeline between 2100-2150), and our political masters are puppets of nefarious alien overlords. Things will kick off in July 1999, starting in the U.S. but then affecting all the nations of the world (shades of the U.S. sub-prime property collapse of 2008 leading to the financial credit crunch; through to the current sovereign debt crisis and looming Eurogeddon). The bad aliens are instinctively greedy, corrupt and manipulative, while the good aliens (who originated on Earth millions of years ago) are powerless to intervene because of the burden of galactic law. What's striking is that many of the prophecies cited were already scheduled to have taken place, and didn't. Yet, George places them in the public domain through Oram/Pickering in the raw - after the fact. That's either impressively honest, or foolish. There's no massaging of the data, no spin. George doesn't seem to 'own' this aspect of the material he's presenting. He's just the messenger. I'd like to think that this Contactee story would find a wide audience, but leaving it until 2011 to come forward with a close encounter of the fourth kind experience that allegedly happened over 40 years ago may have been a serious mistake. The truth is that the world has become a much more cynical place in the intervening decades, and George has rather missed the Contactee boat. Worse, the passage of time has made it far more difficult for the researchers to verify details of the story (corroborating family testimony, medical evidence, or physical evidence at the quarry). However, if his purpose for coming forward now was more personal and cathartic, then I think the authors have done his story justice. I hope he finds some resolution to this bizarre chapter in his remarkable life. Subtitled "The First Published Account of an Amazing Alien Contact from the 1960s"